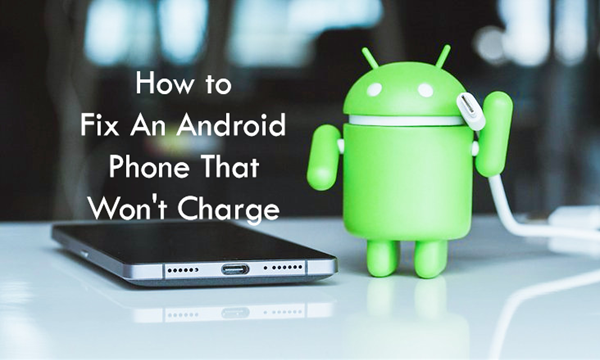 Your Android phone won’t turn on or charge properly? There might a lot of reasons behind it like the USB cable not working properly, the charging port might be faulty or become loose, or a software collapse. It can also be happening because of third-party apps that might be interfering with the charging process or taking too much electricity because of which you can’t see an increase in the battery life when you charge the phone. Another common issue because of which your phone not charging is not updating the software. Always keep your Android phone’s software updated because older software can slow down the charging process. If your phone is not charging when plugged in, you should clean the charging port. For that, you need to first switch off the phone and take out the battery. Use a needle or a toothpick and insert it into the charging port. Make sure there is no disturbance around, so you completely concentrate on the cleaning process. Swirl the needle or toothpick around a little and pull it out slowly. Insert the battery and plug in the charger. If it is working, you are all sorted but if your phone won’t charge, be warned of a serious issue. If you are wondering how to charge your phone faster, use a different power source. If you were using a wall plug adapter to charge your Android phone, try switching to another power source. Try with your laptop or computer. Use a power bank to see if the phone charges faster. There might probably be some problem with the socket, so get it changed as it is unsafe. This method works rarely but you may try your luck. Note down the charging speed before and after you charge the phone. If you ever wondered why is my phone not charging when its plugged in, it is probably the cable. Before you purchase a cable, borrow one from your friend. USB cables have a short life of only two years, which can be lesser or more depending on your use. Always buy an original cable because it has the longest life while others will stop working in two to six months. A phone battery has an average lifespan of two years. If you have ever checked battery health, you will see the efficiency decrease by 10 to 20 percent after two years of use. An old battery either might not charge properly or drain the energy quickly, either of which can be frustrating. You can still continue to use the same battery but if you see a leak or the battery is swollen, you must change it immediately. Did you know that your phone will charge the fastest when you use a particular combination of charger, USB cable, and power source? You can download apps like Ampere that can help you with it. The app checks your battery and measures its life. It gives you a report on the minimum and maximum load levels, maximum current, and voltage of the phone battery. Use different cables, chargers, and power sources to check the difference. Compare the results and select your best combination. If you have plugged in and still not charging, there is some problem with the phone. It is unable to correctly read the battery level and showing a wrong value. To correct it, you will need to calibrate the phone battery. You will have to completely drain out the phone’s battery until it switches off. Turn in on and because there is no power left, it will switch if off on its own. Plug your phone into the charger and let it switch on automatically. Some phones don’t switch off and that is okay. Don’t touch the phone until it reaches 100 percent. Unplug and turn on your phone. If it doesn’t show that the battery is at 100 percent, plug into the charger again. Once it is at 100 percent, unplug it. If the level goes down immediately, restart your phone and plug into the charger again. Keep this on repeat until the battery shows 100 percent when not on charge. Discharge the battery until it switches on and charges it to 100 percent without interfering. This should calibrate your phone. You can calibrate the phone every three months and not before that as it might damage the battery. 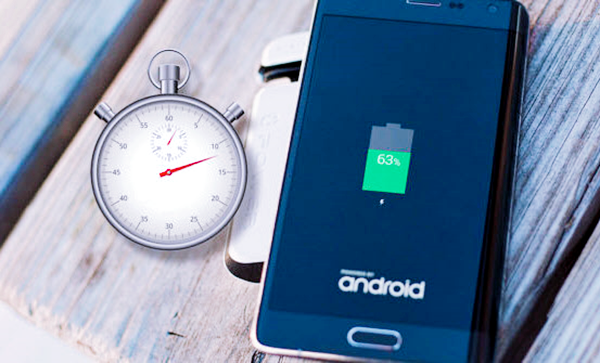 If you don’t want to experiment with your phone’s battery, you can use these tips to charge your Android phone faster. An Android phone charges the fastest when you charge it when turned off. You won’t be using anything, so you will come to know exactly how much time your phone takes to charge. If you want to use the phone and still want it to get charged fast, put it on flight mode. If you live in a low coverage area, your phone will take longer to charge since the lot energy is consumed to maintain a connection. Go to Settings > About Phone > Build Number. Tap it five to seven times until you activate the Developer Options. 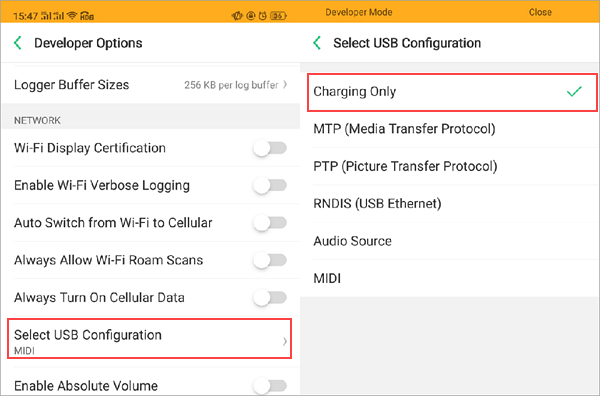 In the Developer Options settings, go to Select USB Configuration. Tap on it and several options will display on your screen. Select the first one, which says Charging and hit OK. When you are out traveling, you tend to use your phone more often. Charge the power bank in the previous day and you have an ample amount of energy to last you throughout the day. If you invest in a good quality power bank, it will charge your phone’s battery to 100 percent for at least four times. All types of smartphones have lithium-ion batteries. If you want a fast charge, the temperature of the battery should be maintained between 41 and 113 degrees Fahrenheit. The phone case tends to keep the heat within itself and increase the temperature, which can slow down the charging speed. Wireless chargers are slow and not ideal when you are in a hurry to leave the house. Some tests even showed that wireless chargers are 50 percent slower than an average USB charger. Two simple reasons can explain why it is slower. The first reason is that energy is transferred faster through a cable and second is that a lot of energy gets wasted during the charging process. A friend asked me the other day why is my phone not charging. It was because it was using a fake cable that slowed down the charging process extremely. Even though expensive, you should always use an original USB cable and charger because it protects the battery and extends its life. Is it a problem with your electric connection or socket? Has the phone charging socket gone bad? Your phone might not be charging well for several reasons. Our guide on how to fix Android phone that won’t charge will help you out. You can combine our tips with the solutions and ensure a faster battery charge. 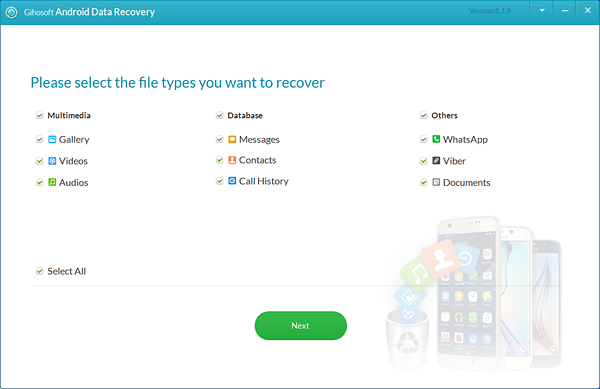 Tip: If you lost data from your Android phone, here is a powerful Android data recovery software can help you recover lost or deleted data from Android mobile phones quickly. Download now!